Just before the seasons change – and you transition over to long sleeves, heavier weight fabrics, lined leggings and other fall and winter staples – is the most perfect time to clean out your closet. (Rinse and repeat just before spring.) Here are my personal tips for cleaning out your closet without totally losing your mind. Bonus: I’ve asked several of my favorite retailers here in town to share theirs, too. Some of us have different suggestions on how to tame the beast, so use the tips that work best for you! I’m sure I read this in a magazine or on a professional organizing blog years ago. I don’t remember when I first picked it up, but it’s been keeping my wardrobe fresh for several seasons now. 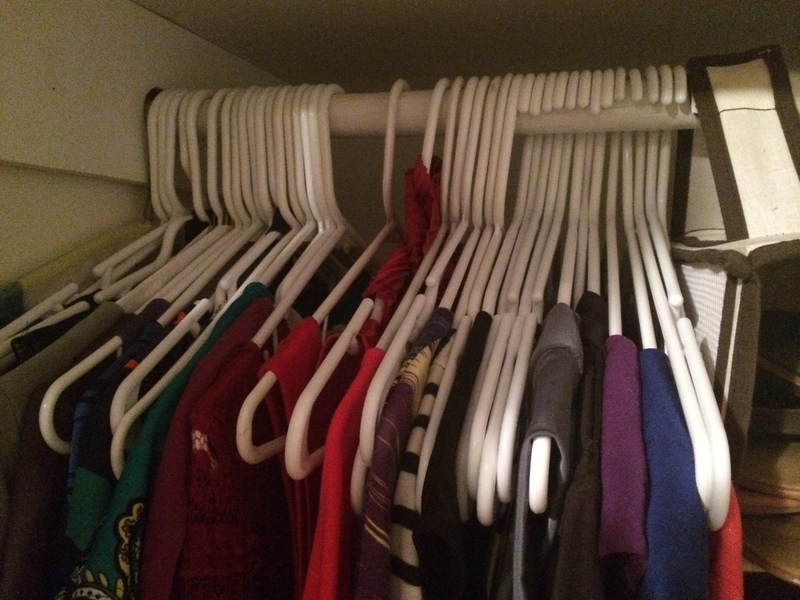 At the beginning of the season when you’re changing over your wardrobe, turn all of your hangers the “wrong way”. 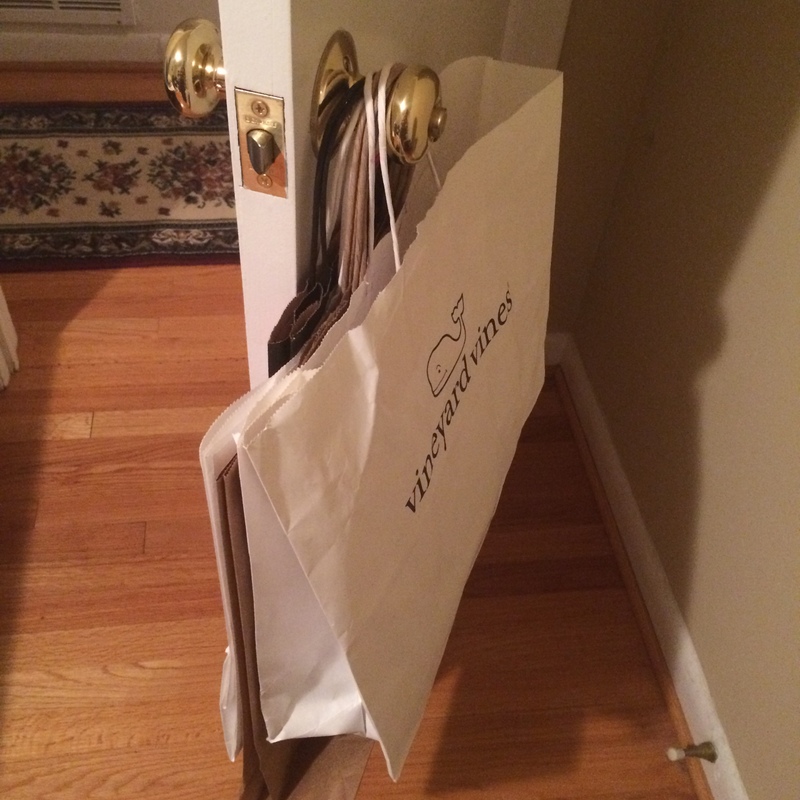 (This requires being a bit OCD – you have to commit to having hangers face one way, what you’ll decide as your “right way” on a regular habit.) 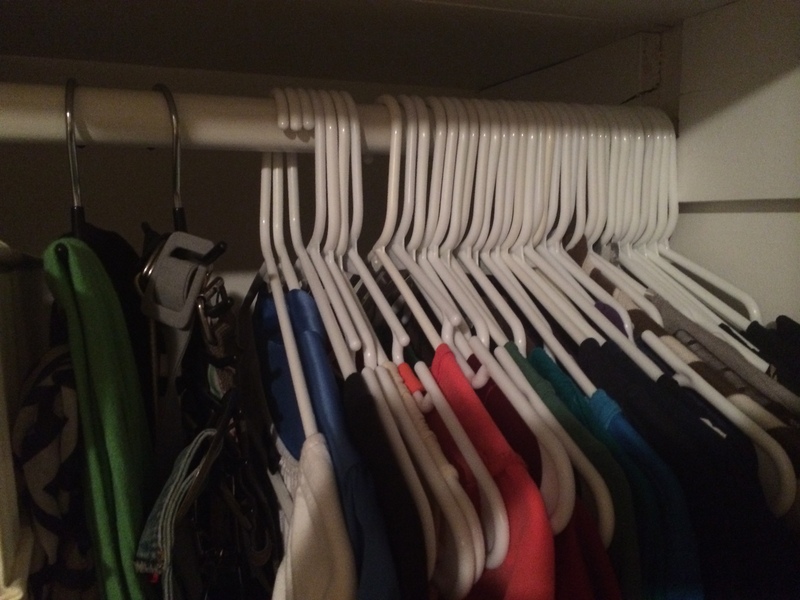 As you wear items out of your closet and launder them, turn the hanger the “right” way when returning it to the closet – this indicates you’ve worn it. In six months (or whatever period of time you deem to be “too long”), any hanger that is still the “wrong way” means you haven’t worn it in six months. Time to donate it! This trick forces a visual cue that you need to wear something or you might end up nixing it. Don’t think that mental trick works? Just ask my office-mate at work, who thinks I’ve been shopping like a crazy girl because I keep showing up “new to her” outfits. Cleaning out your closet doesn’t have to take up an entire Sunday. It’s something you can do one day at a time. I keep empty shopping bags (the nice ones with flat bottoms and sturdy handles) on the back of my door and every time I decide it’s time to part with a single item (tank top, jeans that just don’t fit “right” anymore, that skirt I could never find the right top and shoes to go with), I simply put it in the bag that’s conveniently hanging on the back of the door. When the bag is full, the bag goes to the car with me that morning and gets donated on the way to work or on the way home. Try both of the techniques above and see how just how simple it is to clean out your closet, and keep it that way, without losing your style soul in the process. Nancy Alinovi, ADORE Designer Resale Boutiques: Follow the rules and do it in stages. From personal experience I have learned that if your closet is stuffed, it is because you love fashion, are a bit of a hoarder, are just not sure what to wear, or all of the above. It is not only important to have that closet or closets organized, but you really must, at least once a year, edit some things out. Stay tuned next week as we feature a bonus article on iheartretail.com including Nancy’s 10 rules for cleaning out your closet! Michelle DeWitt, Jitty’s Boutique: The key to a flattering wardrobe is all about fit and proportion so pull everything out of your closet that pulls or buckles. Keep everything that plays up your strengths. Keep in mind your best colors – those that show off your eyes and work best with your coloring. Arrange your clothes by season then put all sleeveless in front, short sleeves, then long sleeves – pants at the back. Group by color and see what seems to be predominant. My experience is that people tend to continually buy the same colors. This is good because it shows you inherently know what flatters you. Example: people come into the store and say, ” I’m not gonna buy another black piece” and guess what they buy? The best way to do the closet cleaning is with a true friend. When you are done bring in your favorite key pieces and we can help you move forward and fill the voids! Amy Gray, GrayLee Designs: I am personally involved in this question as I working on doing this right now at my house. The easiest thing to do is get organized. You really want to be able to see everything in your closet before making decisions. I do this by putting tanks with tanks, tees with tees, long sleeve, short sleeve, skirts, shorts, pants and dresses. After you’ve done that I usually go through and sort out items that I haven’t worn in over a year. If you haven’t worn them they should probably be donated. Another thing to think about is what is your style now? I don’t know about you but, my style changes at least every season and sometimes twice, but, things you wore in college or high school aren’t the current style you so you should update that! If it’s not your style, you’re not going to wear it. Kendra Leonard, the art of style: Try on everything. I mean everything. If it doesn’t fit, has defects – get rid of it. As you go through, organize things by sleeveless, short sleeve, long sleeve, sweaters, pants, dresses, outerwear. Don’t forget shoes and bags or even scarves. Make a day of it (or three) put on some music, and purge. It feels great and helps you move forward instead of holding onto memories of what the clothing brought you. If it’s not fabulous, it’s not worth keeping. Lisa Stansbury, Fred’s Beds: The first step in cleaning out your closet, is to make your bed. That way you have a neat surface to sort your donate and keep piles on to! So readers, got any great tips to add to the pro tips for closet organization? Leave them in the comments below!